This nutritious beverage is made from Ganoderma lucidum extract, quality coffee, non-dairy creamer and sugar. GANOCAFÉ 3-IN-1 is the first known beverage in the world that comes in a combination of coffee and Ganoderma lucidum. A rich blend of gourmet coffee, non-dairy creamer, and natural sweeteners with a nutritious herbal booster, Gano Café 3-in-1 is the ideal latte for your active life. 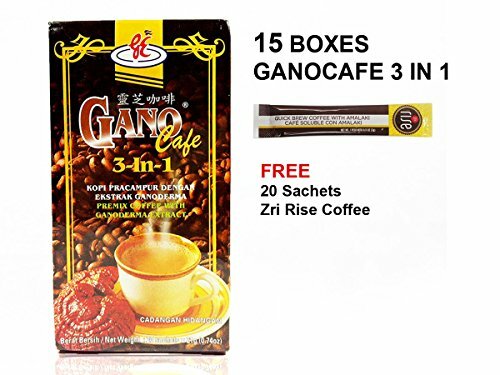 Gano Café 3-in-1 combines rich coffee house taste with whole-person nutrition, making it the best way to start your morning right. Gano Café 3-in-1 is the latte for your life: body, mind, and spirit. Creamy Coffee with healthy herbal boost, Comes in easy-to-prepare sachets, Prepared from organic ingredients, Coffee house flavor meets whole-person nutrition. * Bargain! * [Guangdong corn beard tea 1 box (1.5Lx12 pieces)] can drink clean gulp to 0Kcal diet healthy drink Korea tea Korea food hot summer ~! !